Zionism is a nineteenth century European settlers’ movement presented its mission as a return to ‘an empty wasteland that has been waiting for them since thousands of years to make it habitable and prosperous.’ Today, the Jewish settlers in Palestine have been tracing their roots as a nation state in biblical antiquity. In modern colonialist Israel, archaeology plays an important role in affirming the claimed links between the intrusive European colonialists and ‘ancient tribes’ that lived in Palestine two thousand years ago. Linking the ancient past and the political present plays a crucial role to any claim by the Israelis to possess the land and effectively silence any attempt to provide the history of the indigenous Palestinians. Even in the West, the history of ‘ancient Israel’ has been a major part of the education in the schools of theology. Biblical studies in the West, according to Edward Said, have been given full weight of authority and became in many ways an extension of the Orientalist discourse that depicts the Middle East culturally backward. It has denied time and reality to the civilization of the indigenous Palestinian population who lived on the land, domesticated animals, developed advanced culture there, and traded with neighboring states before and after the ‘ancient Israel’. Arthur James Balfour, the British foreign Minister and the author of the 1917 infamous Balfour Declaration was an Orientalist with strong belief in the inferiority of the non-Western nations. He was making a reference to ‘ancient Israel’ when he offered Palestine as “a natural home for the Jewish people” in his Declaration. If the Israelis remember Masada that allegedly took place more than two thousand years ago and needed archaeology to prove it happened, the Palestinians shall not forget the massacres of al-Qastal battle in April 1948 and Gaza wars in 2008-9 and 2012, and al-Nakba in 1947-48 with living participants and eye-witnesses to support their unfolding events. Unlike the Masada rebels who allegedly committed suicide rather than surrender to the Romans, the Palestinian fighters in al-Qastal were defending villages from being ethnically cleansed against much larger and well armed Jewish military. Under the command of Abdel-Qader al-Husseini, the Palestinian fighters displayed great heroism before all were killed, guns-in-hand. Al-Qastal and its surroundings today are cleansed villages and towns, part of Israel, District of Jerusalem. Its inhabitants are among the 1948 refugees who were expelled from their homes or fled in pre-Israel Palestine. Palestinian fighters in besieged Gaza City defended the City and the Strip against the most powerful military in the Middle East. Prime Minister Ariel Sharon order to remove all Gaza’s Jews and withdraw all Israeli military from Gaza in 2005 was a rational decision. It was an admission by the most militant Israeli leader that physical occupation of Gaza was too costly to be sustained. The Israelis discovered that the Palestinians can be bombed, blockaded and starved but not subdued. 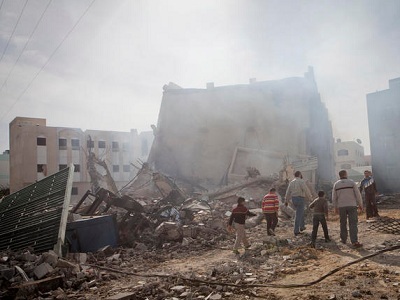 The 2008-9 Israeli attack on Gaza’s populated area with aerial strikes, naval bombardment, artillery and missiles destroyed the city, killed more than 1300 and injuring more than 10,000, mostly civilians and children. The Israeli tanks and Cobra helicopters launched their Hellfire-missiles, but the Israeli ground forces stayed in the outskirts of the city and did not attempt the conquest of the city or the refugee camps because the outcome of such invasion would not be an easy-walk. On November 14, 2012 Israel assassinated Ahmed Ja’bari, the commander of Hamas’ military wing, Izz al-Din al-Qassam Brigades with a missile fired from a drone. Hamas military response was rockets fired at Israel from Gaza in defiance; Israel launched ‘Operation Pillar of Cloud’, an all out war of indiscriminate shelling and bombing against Gaza infrastructure and civilian houses. Israel claims that its forces targeted more than 1,500 military sites in Gaza Strip, but that did not stop the Palestinian fighters from firing rockets toward Israeli cities and towns till a ceasefire was announced. Like the Palestinian refugees everywhere, Gaza refugees’ hope of returning to their homes has foundered by Israel, Western governments and the incompetent Arab and Palestinian leaders. The Palestinians have the right to fight for their natural rights that have been denied for generations. On July 5, 1950, Israel’s parliament passed the ‘Law of Return’ that allows any Jewish person to become an Israeli citizen upon entry into Israel. At the same time, Israel denies the Palestinian refugees right of return to their homes, farms and businesses; most of their houses have been demolished by the Israelis; and some of their houses are declared as vacant and allowed Jewish settlers to move into them. Hasan – a lot of chutzpah in this article in downplaying ancient texts which have been continuously observed and examined for thousands of years. Israel/Jerusalem, the Jewish ancestral home, has been in our hearts and on our lips for all that time, and in our presence in the holy land. We never forgot Zion. Arab settlers came and went and Mohammedism only turned up 1400 years ago so you can’t reinvent history prior to them to make it look good for Arabs, even by building a mosque on the spot of the Jewish temple, in a place that is NEVER mentioned in the koran but mentioned thousands of time in the Tanach. So what are you on about? We also remember more modern massacres of Jews by Arabs at Lod, Ma’alot, Egged buses, Pizza shops, Dolphinarium. That memory doesn’t solve the problem, only compromise and peace and a willingness for Arabs to solve problems of other Arabs without hate, as we Jews have done and continue to do. Am Yisrael Chai. If anyone has a lot of chutzpah that would be Mo. Mo Howard was a better stooge than you’ll ever be. Spewing the same old lies and revising history ain’t going to work anymore. The gig is up for you Zionists. The world can see what you are doing. These are not ‘biblical’ times and you can cover the blood of your victims with a book of voodoo. Time for you to go back to wherever it was that you came from. It’s time for the Middle East to heal from what you have done to it for the Palestinians to get their land back. Leave! The Palestinians are the descendents of all the groups that inhibited Palestine since the ancient Canaanites and beyond. Palestine was successively conquered by Canaanites, Philistinians, ancient Hebrews, ancient Egyptians, Persians, Greeks, Romans, Byzantines, Muslims, Crusaders, Ayyobies, and Turks. The groups which lived in Palestine fought, inter-married, collaborated and no group was obliterated. You are very right in talking about all the tribes that conquered this area BEFORE Moses came along. Even Moses himself talks to the various tribes that were there. Some he gave the name Cannanite to and others have other names. Some Josiah was to attack since they were small and therefore weak and others were large and dangerous. Guess what!! Those latter ones were the ones Moses told him to avoid. It is all lined up in the Fifth book called Deuteronomy of The Old Testament . Pass the information on to MO at the top! Her remarks are too much like Netanyahu’s and his father’s even if they claim more from Zionism than from earlier prophets and teachers. The article does not contend the religious significance of the Biblical texts, but the cynical exploitation of those texts for a colonialist agenda. Such an exploitation is verily a profanation of the Bible. You lot historians ,archaeologist,writers and all sorts of clever people. What really boggles this simple mind is if there was Palestine before Jerusalem, Mo Mo where is the Palestinian ancestral home? If the Zionists can uproot out of Europe after almost two thousands years and create the Jewish State of Israel why can’t the Romans come and claim the South of England, after all the Romans were there before the Anglo Saxons or Normans. The saying the abused turned abuser is Spot on in the case of the Jewish state of Israel in the daily brutalising and dehumanising of the Palestinian people. I am convinced that Israel does not want peace. It has broken so many UN resolutions for one to care to remember. The Jewish state has attacked its neighbours, and threatened them constantly.Keep[s expanding its settlement and destroying Palestinian homes and taking their land. Am Yisrael Chai I hope means equal rights and Justice for the Palestinians for as the saying goes ”the child that says its mother will not sleep shall know no sleep itself”. Shalom. Zionists have selective memories. Take Ma’alot for example. Not only did Moshe Dayan refuse to negotiate, over the strenuous objections of General Mordechai Gur, the Palestinian demand for the release of prisoners, what is totally forgotten is what preceded the tragedy in which 22 members of a paramilitary youth group were killed in an exchange of gun fire. For two entire weeks prior to Ma’alot, Israeli war planes continually dropped napalm on Palestinian refugee camps in southern Lebanon. In the modern era let us not forget all the Zionist thugs, criminals and outlaws. Where to begin? Begin and Shamir for the terrorist bombing of the King David hotel, Shamir again for the assassination of Count Folke Bernadotte, the UN mediator, Begin again for the bloody massacre of 250 at Deir Yassin about which he bragged of the chilling profusion of the slaughter in his book, The Revolt. I could go on and on. Buzz off you Zionists! Go back to Brooklyn, Europe or Ukraine wherever it was that your colonialist ancestors came from! Leave the Palestinians alone you war criminals! The Chutzpah that Hasan is talking about is the one that the zionists concocted since Balfour to occupy a land on which happy people lived on calling it home and create a project to further the business interests of wealthy people in the west. Oil!!! But mind you Mr.Mo these zionists are bringing the wrath upon themselves. Perhaps you can find it in the ancient texts. They are the victims yet again of the greedy white man.In fact the Christian Right fanatics are doing just that: bringing as many Jews as possible to Palestine for a final day of judgement, Gemorrah. That’s not ancient. That’s in the making. That’s what they’re saying. Watch your back, not from The Palestinians, but from these midieval narrow minded blood thirsty cockroaches. Oye Vey!!!! Palestine can be found on major world maps prior to 1948, it is found on currency, the British ruled the Palestine Mandate, not the Arab Mandate or Muslim Mandate. Which is also very insulting, omitting the fact that 20% of Palestinians are Christian and pre-zionist project there were Palestinian Jews (who by the way resented and shunned the zionist emigrees, because they knew they’d be trouble.) All to hide the fact that the three major religions in the Holy Land had co-existed mostly in peace since the 700th century – 1,300 years of neighborly respect and co-habitation. Since 1948 when the zionists initiated their experiment there has been no peace, when peace is possible the zionists reject it. The zionists are not in the land to live and dwell and thrive — they are there to dominate, exploit and move on. Nomadic people have no love of roots – the very opposite of the deeply rooted, enmeshed Palestinians nurturing and caring for the land, mother earth..
You cannot wish away the history of Palestinians in Palestine, you may rewrite the history, but our very molecules remember, and home is a major part of one’s identity. All very nice fantasies from the historical revisionists but it doesn’t change the facts. There is no Palestinian Arab history because as Gingrich remarked, the Arabs in question are more correctly termed Fakestinians. Some trace their roots in the area back some centuries but the majority are from recent Arab immigrants from the area whose identity was always just “Arab” and there is no cultural, ethnic, religious or regional distinction between Arabs in this area or any other in the Middle East. Many came seeking work in the territory of the mandate. So again, don’t reinvent history, and just for fun see if you can find a historical reference anywhere to an Arab, before say 1900, referring to himself or herself as a Palestinian, or whether anyone else described him as such. This doesn’t alter the need for a peace settlement but it can only be one based on compromise and not on denial of Jewish rights to the Jewish State of Israel. Am Yisrael Chai. Pretty good article. It should be noted, however, that the folks at Masada were thugs, criminals and outlaws who had been driven out from decent Jewish society by the Jews themselves. Interesting comment Losswevatore – let’s bring it into contemporary context. The guys from terrorist groups such as Hamas and Islamic Jihad are “thugs, criminals and outlaws who (should be) driven out from decent Arab society by the Arabs themselves”. Unlike the Jewish zealots of Masada, the Islamists are bone fide terrorists determined not to live in peace but to murder and suicide and take all their fellow Arabs with them, but nevertheless it’s an interesting comparison which you’ve inspired. Revisionism: That is the key word to Mo’s entries on this thread. One should wonder where Mo is getting his “information” that he uses as factual and historical. It is always interesting how the Zionist Jewry can create the multitude of mythinformation they present to the world to justify their illegal, immoral, terroristic state of Israel. It begins to be laughable now that the international community has isolated them and is aware of the fairy tales. Please, Mo. Stop with the sophistry. We are no longer swallowing that kind of garbage. Maybe it’s time to try something new……..the truth. Salaam.